Among the many good reasons to do that: she may be part of an all-female pickpocket squad. 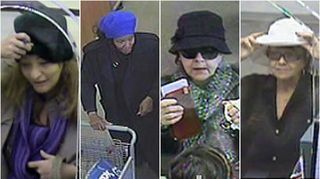 Police in [Sterling Heights, Michigan,] say an all-female criminal ring, made up of middle-aged and elderly women, are running a sophisticated con in which they pick the pockets of unsuspecting shoppers and use the stolen credit cards elsewhere. "The common denominator between the suspects is that they all are wearing hats at the time of the theft and/or fraud, which has caused the group to be dubbed the ‘Mad Hatters’ by the financial institutions," the Sterling Heights Police Department said in a statement. Police believe there are at least six Mad Hatters and that they have stolen more than $500,000 over the last year and a half. I was going to encourage Michigan readers to start launching preemptive strikes against any woman wearing a hat, but then I realized the one on the right looks an awful lot like my grandma. So please, no vigilante justice.